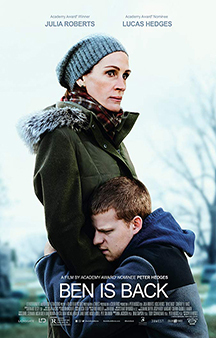 MOVIE SYNOPSIS: Nineteen-year-old Ben Burns unexpectedly returns to his family's suburban home on Christmas Eve. Ben's mom, Holly, is relieved and welcoming but wary of her son's drug addiction. Over a turbulent 24 hours, new truths are revealed, and a mother's undying love gets put to the test as Holly does everything in her power to keep Ben clean.